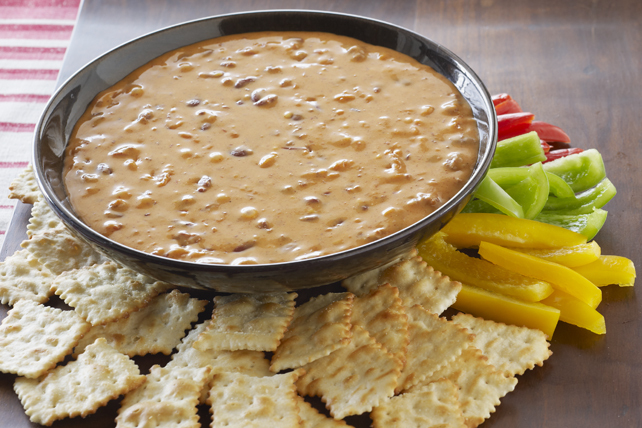 Just 2 ingredients and 10 minutes stand between you and this VELVEETA Chili Dip. As cheesy dips go, it’s a classic. Microwave ingredients in microwaveable bowl on HIGH 5 min. or until Velveeta is completely melted and mixture is well blended, stirring after 3 min. Cut 225 g Velveeta into 1/2-inch cubes; place in medium microwaveable bowl. Stir in 3/4 cup canned chili. Microwave on HIGH 3 to 4 min. or until Velveeta is completely melted and mixture is well blended, stirring after 2 min. Makes 1-1/4 cups (300 mL) or 10 servings, 2 Tbsp. (30 mL) each. Refrigerate any leftover dip. Reheat and serve over hot baked potatoes or cooked pasta. Serve with tortilla chips, assorted crackers and/or cut-up fresh vegetables.